Yesterday, Gotham. Before that, The Flash and Arrow. 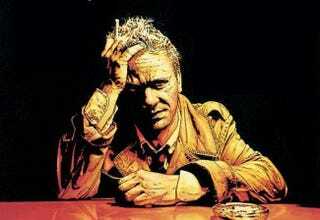 Now NBC has ordered a full pilot for a series based on Constantine, a.k.a. Hellblazer, and suddenly Marvel's Agents of S.H.I.E.L.D. and in-development Netflix series are looking more than a bit anemic. On the plus side for Marvel, at least, is: 1) a pilot doesn't mean the series will get picked up, and 2) Gotham still sounds terrible. But on the plus side for DC, Constantine sounds like a good thematic match for Grimm, whose Friday night ratings make it one of NBC's most-viewed shows (which is both a testament to Grimm and to how completely incapable NBC is at making entertainment large groups of people want to watch). Another plus on the DC side is that the pilot is being written developed by The Mentalist's executive producer Daniel Cerone, along with screenwriter David S. Goyer, and Cerone knows his way around popular TV procedurals. On the plus side for Marvel, the Constantine pilot script had a commitment with penalty, meaning if NBC didn't order the pilot, they were going to have to pay Cerone and Goyer a lot of money for nothing. It's entirely possible that NBC, who was on the hook no matter what, decided to order tje pilot even though they have no intention of picking it up.